An old cold painted authentic Vienna or Wiener Bronze cast in the traditional lost wax technique (cire perdue). 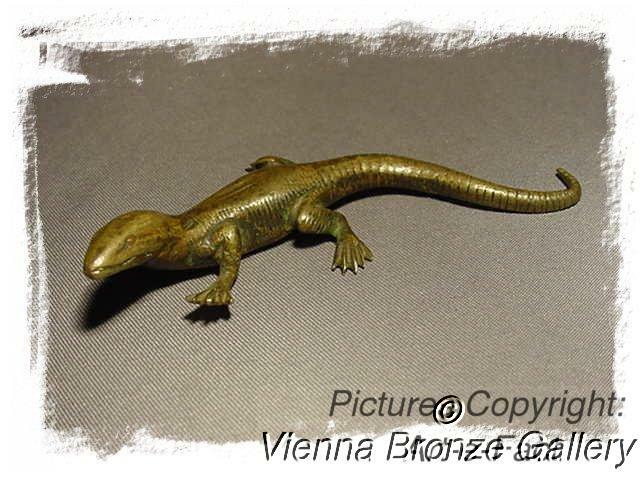 A fabulous early figurine, a lizard or salamander. The bronze dates back to the second half of the 19th century and the age has caused that 99 % of the paint has been rubbed off. In the corners of the legs when looking at the underside you see some remainder of the original paint. It's an early example of Austrian bronze art dating back to the late 1800s. Good. Age related heavy paint losses as described above. Original paint, no restoration, no repairs, no touch ups! Please do not forget that you are bidding on a used item that always may show some traces of wear!